There are so many options for beautiful venues for a Mexico destination wedding! Luxury resorts, boutique hotels, and private villas are all unique possibilities. Renting a private home for your ceremony and reception is always a special treat for your guests as it allows them to go somewhere new instead of staying at the same accommodation for their entire vacation. Renting a private villa may also allow you to have greater flexibility in terms of the wedding vendors you bring (some resorts will only work their own vendors or charge you a fee to bring in others), less restrictions in terms of your reception or entertainment (no curfew or limitations on having a live band for example), and more ability to make personalize your wedding. Depending on the style and location of the villa, it may also be a more economical option. This bride had her wedding reception at a private villa in Zacatitos, on the East Cape less than a half hour from San Jose del Cabo. It is in walking distance to the Zacatitos beach where they had their ceremony. The groom is an architect so he wanted a location that met his contemporary aesthetic. While this couple knew the owners of the villa, you can find many options yourself via Airbnb and VRBO or book through a specialist in Cabo luxury villa rentals like CaboVillas.com or caboluxuryvillas.com. For the best options, ask your Cabo wedding planner to recommend an appropriate villa. Our favorite villas in Los Cabos include Villa Vista Ballena, Hacienda Cerritos, Villa Turquesa, Villa Bellissima, Villa Santa Cruz, and Villa Las Rocas. If you are having a destination wedding in the Todos Santos or Pescadero area and are simply looking for accommodation for your guests, there are many vacation rental options available on Airbnb, Homeaway and VRBO. Our personal favorite vacation rental in Todos Santos is our own Todos Santos Beach House with Pool & Hot Tub. One of the elements we loved at this private villa wedding was the bride's beautiful bouquet. 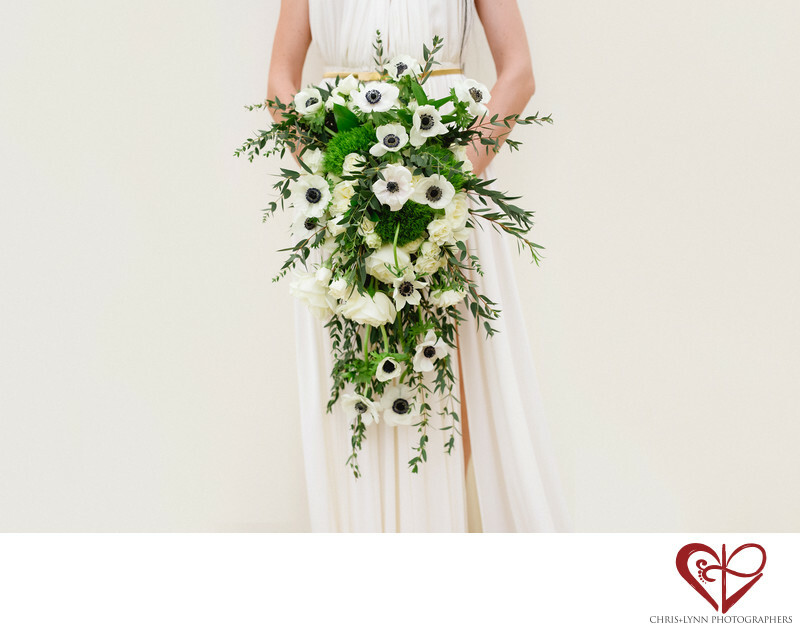 Her cascade bouquet was defined by black and white anemones - such a distinctive and dramatic flower. Surrounded by moss and roses, the unstructured design is the perfect compliment to the bride's simple and elegant Grecian-style gown. In fact, according to ancient Greek mythology, the delicate anemone flower sprung from the tears of Aphrodite, the goddess of love. It also symbolizes anticipation - very fitting for a bride waiting to walk down the aisle to see her groom! Like her dress and her choice of venue, a bride's bouquet is such a personal choice and reflection of her style. This bouquet and all the flowers at this wedding were designed by the team at The Main Event Cabo. Overall design and planning of this private villa wedding was done by Mexico destination wedding expert Karla Casillas and Co.